Painting in any form is usually a very enjoyable pursuit or passion or obsession, but lately I’ve been doing so many tight and detailed paintings that I wanted to do something FUN. Here is the finished product…and below you will find the steps. Here’s what I started with: a 12×12 gallery-wrapped canvas on wooden stretcher bars. 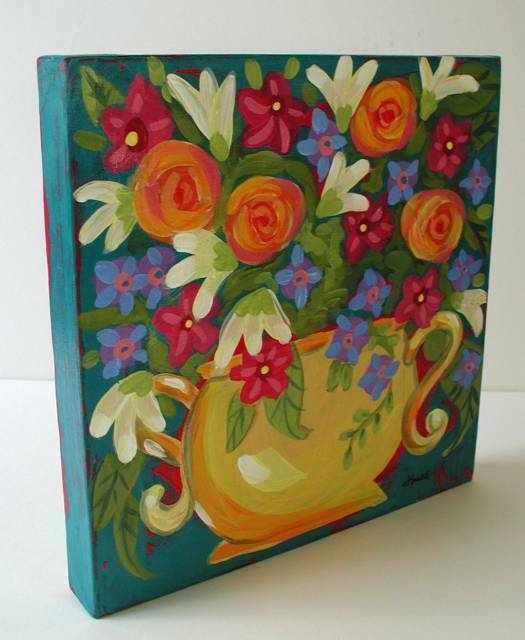 These are available in many different sizes at art supply stores in your town or online. 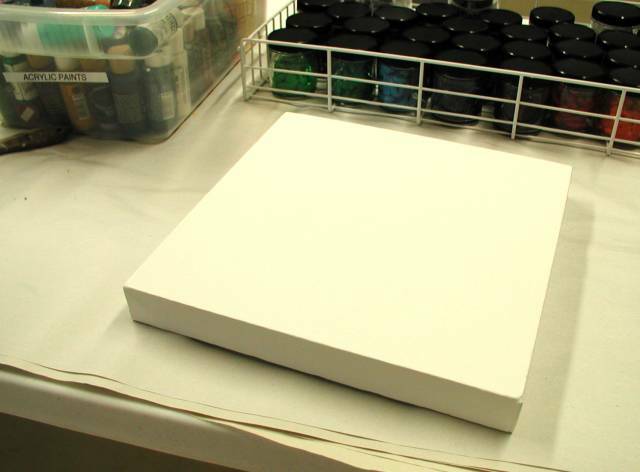 The canvas comes already covered with gesso. In the upper left corner you can see my bin of acrylic paints…and to the right are all my oil paints, which I have recently put in glass jars. At this point in the game I didn’t even know which type of paint I’d use…then I remembered the previous day’s painting and the headache I got from, I believe, the paint thinner I use to clean the brushes. So, acrylic. 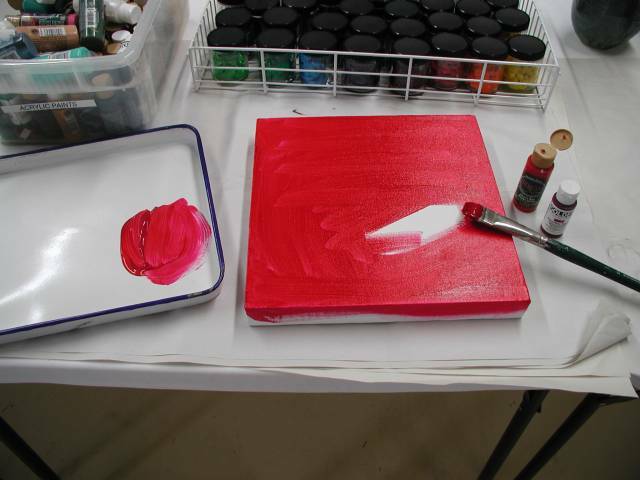 I mixed red and hot pink acrylic paint and covered the canvas surface — front and sides — with it. It is important to keep a jar of clean water nearby to rinse your brushes as acrylic dries very fast. 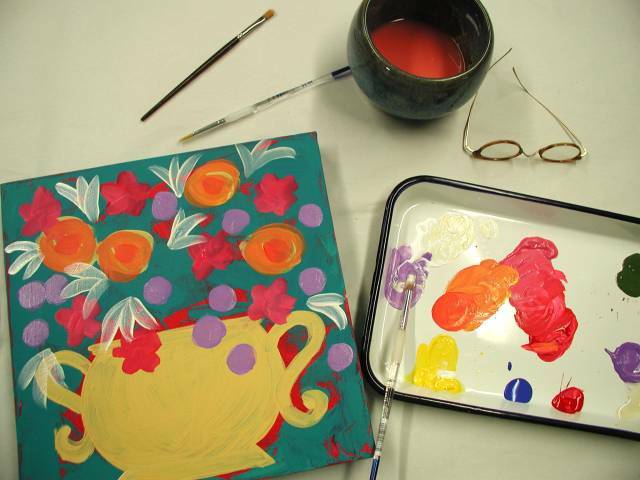 That’s oneof the joys of working with acrylic as opposed to oil paints, which dry very slowly. 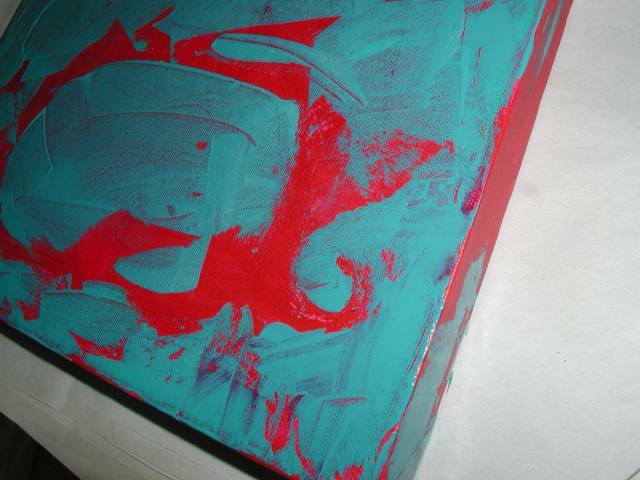 Turquoise and red are one of my favorite color combos and are just about opposite each other on the color wheel. Any time you put opposites together it creates an effect that almost makes the colors appear to vibrate. Look for advertisements that exploit this to attract attention. 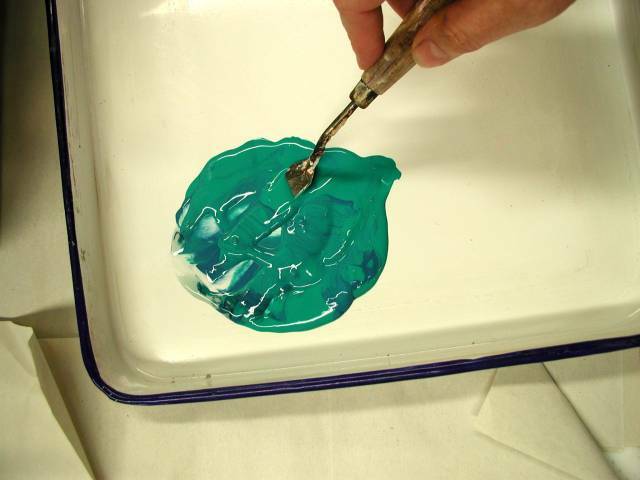 To make the turquoise I mixed a blue and green together. Don’t overthink color mixing: if you like the color, use it…you aren’t the paint department manager at Home Depot…your color doesn’t have to match someone’s sofa. Be loose! Now the real fun begins! I spread the turquoise paint with a pallette knife…this is difficult to control and I love the random wonkiness of the result. I want some of that bright red to show through. 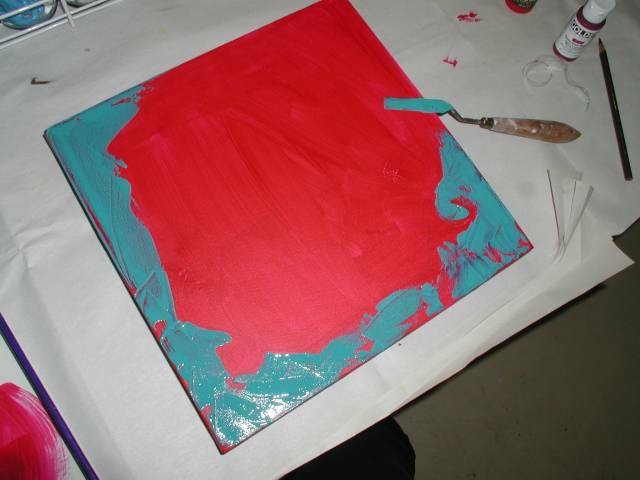 Interestingly, as the turquoise paint goes on, the red seems to get MORE red. That scroll is what determined what I decided to paint. Up to that point I didn’t know if this was going to be a landscape or a painting of a chicken or what. But the scroll looks like the swoopy handle of a loving cup or a trophy, so I think: ah, FLOWERS in a VASE. With this spreading paint technique you have to decide to just STOP…it is so fun, the temptation is to keep spreading and cover up all that beautiful red. I should probably have stopped between the last step and this one and taken a photo, but I was having such a good time I completely forgot. You can see some of my tools here: the water bowl (which needs to be changed), my glasses and my favorite made-in-china enameled butcher tray that I use as a pallette. 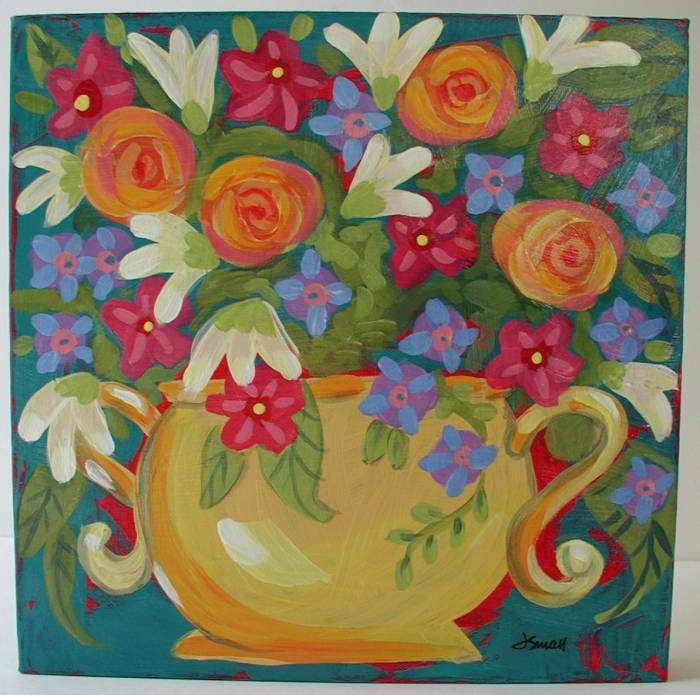 I chose yellow as the color of my vase because it contrasts nicely with the turquoise. 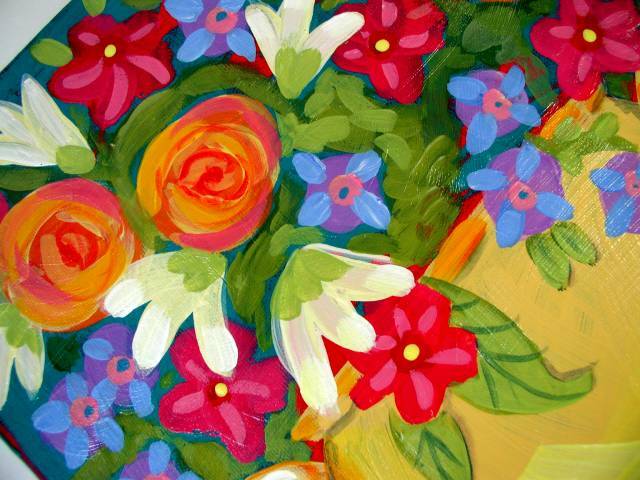 The flowers don’t exist in nature, just my imagination…but I am going to try to turn those orange ovals into roses. This photo shows a close view of the flowers. You can see that they are made of loose (that’s the MAGIC word!) brushstrokes and layered colors. Acrylics dry so quickly that by the time I had made all the purple circles, the first ones were dry enough to add the blue petals over the top. I’ve painted three shades of green in between the flowers to suggest foliage, and I’ve added some leafy shapes at the outer edges of the bouquet. Here’s the finished painting standing on its wide edge. This can be hung frameless or placed on a shelf or table. I like unframed paintings, probably because we owned a frame shop/gallery in Texas and if I never have to frame another thing it will be too soon. 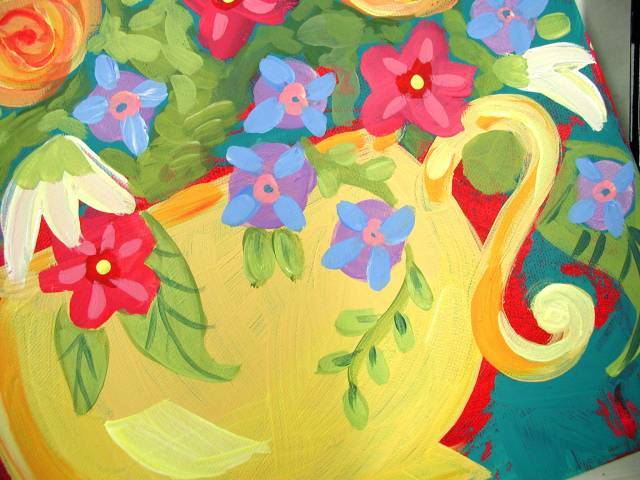 Here’s a close-up of the finished painting. I varnished it with a clear gloss arylic gel to make it shiny. Certain acrylic colors are more matte than others and I wanted the surface to have a uniform sheen. The gel gloss also seems to intensify the colors. This was such a fun project and just what I needed after so much “tight” painting. For mental health I’m going to try to do a LOOSE project like this every few days. Tell me what you think…and send me images of any paintings you do as a result of reading this post.